Principal Jamaal Bowman (left with student) of the Cornerstone Academy for Social Action middle school in Eastchester. 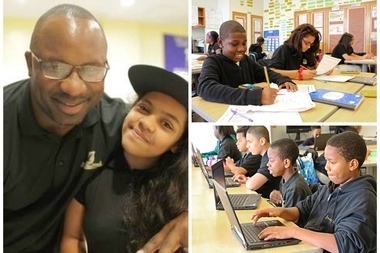 THE BRONX — With nearly 90 percent of its students entering sixth grade with skills below grade level, Cornerstone Academy for Social Action (CASA) middle school in The Bronx ranked No. 1 in the city last year for improved test score average on the state’s English and math exams, its principal Jamaal Bowman boasted. But now Bowman has become one of the most vocal principals defending parents’ rights to opt out of the tests that will be given to the city’s third- through eighth-graders next week. He's been speaking at schools across the city and state about the importance of educating the “whole child” as opposed to focusing on test prep. A multi-dimensional curriculum also helps students tap into multiple intelligences, Bowman believes. His school offers humanities classes and a program steeped in STEAM, involving science, technology, engineering, art or architecture and math. Students learn coding through game design, have a course involving social justice and learn about hip-hop. After-school programs focus on fine arts, gardening and robotics. While principals with more affluent and higher-performing student bodies, such as Brooklyn New School in Carroll Gardens and TriBeCa’s P.S. 234 have been more vocal against the state tests, Bowman is a rare critic of tests in his corner of The Bronx and at a Title 1 school where 99 percent of students are black or Latino. And that’s precisely why he’s trying to spread his message. His stance also runs counter to the messages being spread at charter schools like Success Academy, the high-scoring charter network that will host its annual “Slam the Exam” pep rally Friday, as students have hunkered down with practice tests for a few weeks and are required to come to school for test prep Saturday, parents said. While only a handful of his students opted out last year, many more plan to do so this year, Bowman said, and his school’s PTA president will be among many parents from across the boroughs expected to stand on the steps of City Hall on Wednesday morning discussing their grassroots efforts to inform families about their rights to refuse to take the state tests. Schools Chancellor Carmen Fariña recently told parents from the opt-out movement at an invite-only meeting in Park Slope that she would opt out as a parent if she had a student with special needs or an English Language Learner newly arrived to the country. Still, Department of Education officials have been telling parents that concerns about the tests have been addressed, noting there will be fewer questions this year and the exams will be untimed. Many educators and parents believe it will make little difference to the tests that take six or more hours to complete. Bowman noted that private schools, which parents clamor to get into and can pay upward of $50,000 a year, don’t give these standardized tests. “If it’s not good for them, why is it good for us?” asked Bowman, adding that he would not send his nearly 2-year-old daughter to public school.